Pinch me, please! I feel like I am in a dream! It’s Christmas season and Pinterest is alive and well with an endless world of ideas, inspirations, recipes, and whatever else you can imagine for the holiday season. Can life be any better? I love to deck the halls and this year it has been fun to explore Pinterest and be inspired by all the ideas on the virtual bulletin board! Sometimes it is so easy to get stuck in a rut and decorate the same way every year. That’s not a bad thing but it’s also fun to break the mold and create a new mood for the season. After seeing an idea about using old silverware for ornaments on the tree, I was inspired to use silverware which had belonged to both of my grandmothers and probably even their mothers. Those pieces are dearly loved but I usually have them safely wrapped up in tarnish-free cloths. This year, I pulled them out and proudly nestled them into greenery on a window sill where I also tucked in pictures of my grandmothers as young women. With little white lights, a few pinecones, and some glittered snowflakes I created something which is more than just a decoration, I created a living memory of loved ones and honored heirloom pieces which have been passed down. For me, remembering and connecting with family is an important part of Christmas. Over the years, I have accumulated quite a bit of holiday décor. I try every year to clean my bins out and get rid of items I no longer want to use. But it still seems there are odds and ends which I hang onto, thinking I might need a swath of ribbon or an extra ornament. The other day I found an idea on Pinterest that not only fed my festive spirit but also my thrifty heart! Using an unused artificial wreath, a lone strand of artificial garland, some left over ribbon, unused ornaments and some floral picks which were headed for the garage sale, I created a stunning kitchen chandelier decoration! I loved not having to spend anything and I loved using items which had moved into the “extra bin”! I first attached the wreath to the bottom of our light fixture in the kitchen. Then I wrapped the garland up the fixture. The fun part was adding the lengths of ribbon, ornaments, and floral picks. Impressing my teenage son, not spending a penny and repurposing old decorations?! Merry Christmas, to me! Plus, I broke out of the same decorating rut and added a new festive spirit to our kitchen table area. If you are looking for some new ideas for your holiday decorating, check out Pinterest. You are welcome to follow me on Pinterest and explore my Holiday Décor board for links to the above ideas. 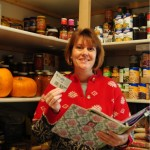 Erin’s got tons of tips for saving money, couponing, and sticking to a budget in her blog archive. And be sure to check out the Missoula Save it Club.